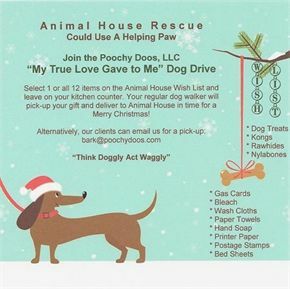 Join Poochy Doos, LLC, a professional pet sitting and dog walking company in Fort Collins, in fulfilling Animal House Rescue’s Wish List this Christmas by donating to My True Love Gave to Me! Get all 12 items or just one and leave it on your kitchen counter. Your regular Poochy Doos, LLC dog walker or pet sitter will pick it up and deliver it to Animal House on your behalf! Individual Pick-Ups for Poochy Doos, LLC clients will be scheduled between December 5th and 16th! Simply e-mail us if you’d like us to pick up your donations! Thanks to all our regular pet sitting and dog walking clients for making our Holiday Drives so successful and for supporting such a worthy cause!